Very interesting! I wonder just how constrained the tracheas of humans are, though, given that deviation of the trachea is a common sign in people with a collapsed lung or pneumothorax. We may simply appear to have constrained tracheas because our necks can’t do the exciting things these bird necks do. We may simply appear to have constrained tracheas because our necks can’t do the exciting things these bird necks do. On one hand, it’s not like our tracheae are actually tied down, themselves. But on the other hand, our larynges and hyoids ARE tied down by lots of strap muscles, which limit the motion of the trachea in two ways: first by fixing the larynx more or less in place, and second by physically confining the trachea from either side. Humans have 3 pairs of muscles that span from the thorax or shoulder girdle to the hyoid or larynx (sternothyroid, sternohyoid, and omohyoid), and we are pretty typical mammals in this regard. I don’t think birds have a single muscle that does the same; they have muscles that attach to the external surfaces of the hyoid and larynx but they start pretty far out on the neck, not on the trunk. So it’s true that our necks are very short and inflexible compared to those of birds, which gives our tracheae fewer opportunities to wander. But the constraint is not just appearance; our respiratory tract has real mobility limitations in terms of both muscle attachments and real estate (room left over between the muscles on either side) that birds simply lack. Not to drive the discussion off-topic, but I only just found out how little a dog’s patella contributes to its well-being. It leads me to wonder how mammalian patellae were conserved long enough to make our knees possible. Arguably, themselves. 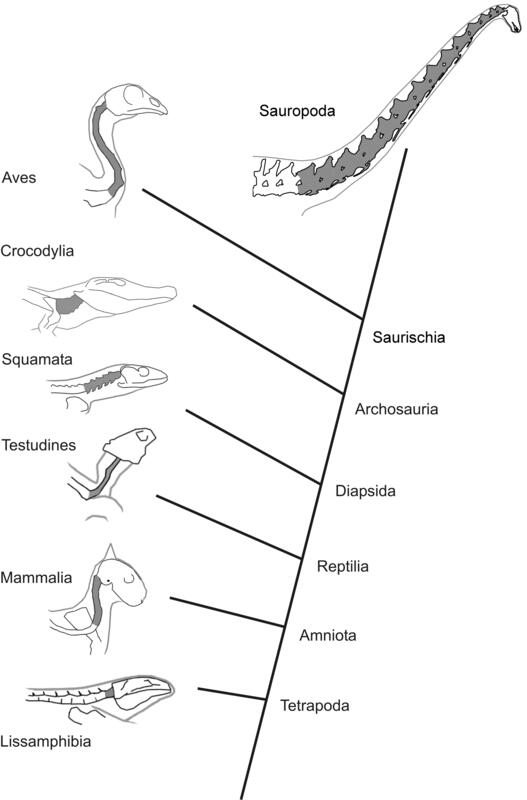 It is interesting that the necks in birds and mammals (some, anyway) are so inherently different that then comparing them to sauropods to derive a “most-difference” qualification becomes problematic, simply because the qualification will differ with respect to what you are trying to derive. There is still something of an issue in which comparative anatomy is forcing researchers to simply extend the analogy of their comparison from one group, to the other, without respect to actual anatomical differences. Sauropods should, first and foremost, be know to have a cervical anatomy that is different from that of other animals. It is not simply gross anatomy, such as the super-complex epaxial muscles in some “short-necked” birds like frigates and black skimmers (which as a complex do cross from the dorsal vertebrae to the back of the skull) and in which the neck is held in a virtually eternal U-shape. Unlike apparently mammals and sauropods, almost all living birds ossify their tracheal rings, which enforces constraints on position, while the esophagus is constrained below the vertebrae regardless. It’s not arguable at all. Of course they had more in common with themselves than with anything else. That is not up for debate. The problem is that sauropods make extremely crappy extant analogues for sauropods due to their not being extant. So given the lame selection of extant animals that we do have, and that we can study, which group or groups can shed at least some light on sauropod soft tissue? And the evidence (both phylogenetic and osteological) suggests that birds are much less inadequate than mammals. Really? In almost all birds, the longus colli dorsalis and other long neck muscles insert on the first three cervical vertebrae in some combination (even the so-called longus colli dorsalis capitis), and the muscles attaching to the skull (complexus and splenius capitis) originate from the cervical vertebrae rather than the dorsals. If the muscles in those seabirds really span from thorax to skull, it is curious that neither the Nomina Anatomica Avium nor Tsuihiji (2005) mention it. In fact, the NAA (p. 206 of the 1993 edition) says of the biventer cervicis: “The only muscle of the cervical vertebral column which connects Notarium (Osteo. Annot. 1 40) with the Cranium (see Landolt and Zweers, 1985; Zweers, et al., 1987); it is well separated from other epaxial museles within a separate fascial sheath (Kuroda, 1962)” [emphasis added]. Unlike apparently mammals and sauropods, almost all living birds ossify their tracheal rings, which enforces constraints on position, while the esophagus is constrained below the vertebrae regardless. Sorry, dude, almost all of that is incorrect. 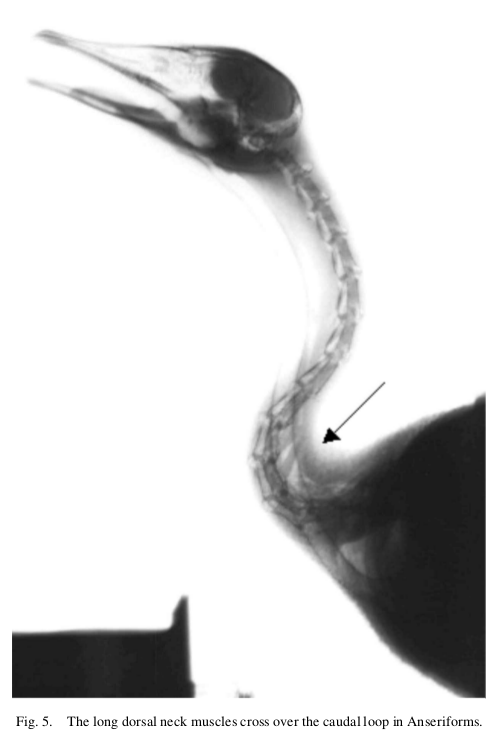 Birds often ossify their tracheal rings but that does not force the trachea as a whole to be rigid; the joints between the rings are what allow the trachea to both slide around and accommodate the often wild changes in flexion and extension along the neck (see, e.g., van der Leeuw et al. 2001: fig. 7). And as you can see in the rhea dissection linked above, the esophagus and trachea are bound in a common fascia, so they move together; the esophagus is emphatically NOT constrained below the vertebrae. You can see the same setup, with esophagus bound to trachea but not vertebral muscles, in my old emu dissection post. I wonder if birds ossify their tracheal rings because the trachea is mobile; stiffer rings would help prop the trachea open in situations where the more superficial tissue might tend to squeeze it shut. I’m not aware of any sources that describe frigatebird cervical musculature, but all of their close relatives (gannets, cormorants, anhingas) have typically avian cervical musculature. What’s the longest-necked extant non-avian reptile? That’s my guess too. How does their neck anatomy compare to that of long-necked birds/mammals/sauropods? Anybody ever get one of them into an x-ray machine? Turtles have wacky, wacky cervicals. Some of them look quite birdlike. I’ve got a snapping turtle cervical on my desk at work. On casual inspection it could almost pass for a turkey vert, except for the huge hypapophysis, or whatever you call the bladelike ventral crest in a turtle. Dunno if anyone ever got a giant tortoise into an x-ray machine, but their smaller cousins are typical tetrapods when it comes to alert neck posture, as we showed here. Turtle necks are something I’d like to know more about. It’s hard to see how they get so much mobility out of so few cervicals–like camels, only more so. I asked a few researchers about work on the subject of radiography examination of in vivo turtle necks, especially in examining neck folding. While this was examined and published, it has not been done to the degree that is known for birds and some mammals. Most of this is done using CT, rather than radiography, which limits the ability to simply sit and watch behavior from the inside. Herrel, A., van Damme, J. & Aerts, P. 2008. Cervical anatomy and function in turtles. pp.163-186 in Wyneken, Godfrey & Bels (eds.) Biology of Turtles. CRC Press (Boca Raton, Florida, USA). The term “hypapophysis” appears to be useful and applicable, as it is in snakes, and is located in the cranial margin of the cervical vertebra. If one is referring instead to the large posteriorly-positioned knob, then this is a process that anchors hypaxial muscles and ligaments, and only really exists in cryptodires; it is absent in most pleurodires, which instead have even more avian-like vertebrae in which the spinal canal passes low on the centrum and the articular surface is divided into sinistral and dextral facets. Matt responded with an incredulity argument of “oh really?” which belies the fact that I never called out specific neck muscles (or really, neck muscles at all). He notes a specific set, a portion of the m. longus colli complex, but I am referring to the entire expanse of modified muscles that run from the back of the skull, through the neck, and to the dorsal vertebrae. These are specially modifed in skimmers (Rhynchops sp., and yes I am using Zusi’s work in part as a reference) which sometimes calcify the tendons (just as in other high-strain tendons and ligaments in birds and mammals). I erred when noting frigate birds: I am actually referring to Anhinga sp., for which reference I do not actually recall although it came up when perusing the literature that led to Zusi’s work on skimmers; similar neck-carriage models are notable in herons, for example, but I also lack that as a reference. Nonetheless, the holding of the neck requires a specially large set of muscles in partions of the neck than in birds that keep their necks straighter, with little differentiation of the osteology. These muscles as a whole exist in a “super-complex” (absent in rheas, I might add) that form a lattice-work “mesh” above the suspended and U-shaped cervical column. Without skin or viscera, this makes the neck semi-lunate or semi-circular in aspect; without the ligaments and tendons above, this makes the neck U-shaped in aspect). This lattice-work is connected by contact with tissues that reach the skull and the dorsum, regardless of their individual insertions, and some insert into other tendons and muscles. Yes, the homology (as Wedel points out) is messy, but that’s true for the most part in birds, and is true even among birds where “unique” muscles and tendons appear without any real constraint on their appearance — their relatedness is for the most part phylogenetically inferred, but functional inference (and thus convergence) is also possible. Naish tries to call me out by noting this muscle system is “typical,” but it is assuredly not (in my opinion). Even Zusi notes this [I no longer have my copy, so maybe I’m blowing smoke and misremembering], and is further true of passerines (if Naish thinks perhaps the great number of passeriform birds somehow makes the necks of U-shaped birds typical, he should tell this to the great number of “long-necked” birds which reduce if not eliminate or never develop the lattice of epaxial muscles above the neck, such as galliforms and ratites, those birds being held as models for sauropod anatomy by a variety of authors, largely because of their size, availability (domestication) and loss of various muscle groups (or their reduction)). We still seem to have an easier time of using the typical Anatomica Avium for birds, while retaining veterinarian terms for crocs, and applying the model of Romer and others from the veterinarian form to reptiles (and dinosaurs) in general. We lack the ability to infer the presence of unusual skin-based ligaments and muscles in dinosaurs, and trying is futile without better resources for constraining our inference. Lack of understanding or respect to the differences imperils the ability to objectively examine the sauropods, and I fear this has led to a general rejection of things like ONP (not just as a life-habit model, but as a constraint on posture) and an aversion to general biomechanical elements (the osteology alone does not suffice, as noted by the Sauropod Working Group). If we really want to be conscious of our biases, I would end this response by noting that in the the first image, somehow similar to the “alert” posture favored by Taylor, Wedel and Naish (2009), the basal cervicals are declined from the horizontal, implying they graduate downward before the upward curvature of the neck, or are bent below the dorsal series in contradiction to the model proposed. Insignificant or no? Matt responded with an incredulity argument of “oh really?” which belies the fact that I never called out specific neck muscles (or really, neck muscles at all). He notes a specific set, a portion of the m. longus colli complex, but I am referring to the entire expanse of modified muscles that run from the back of the skull, through the neck, and to the dorsal vertebrae…These muscles as a whole exist in a “super-complex” (absent in rheas, I might add) that form a lattice-work “mesh” above the suspended and U-shaped cervical column. Yes, that’s true, I did call you out. Because you’re talking crap. You didn’t identify specific muscles. I did. You didn’t provide references. Darren and I did. If not the longus colli dorsalis, then what? Cervicalis acsendens? Does not span from thorax to skull. Biventer cervicis does, as mentioned in the post. Perhaps there is another big epaxial muscle that we’ve forgotten? Feel free to enlighten us. In your first comment you were calling me out for ignoring this “super-complex” that supposedly spans from thorax to skull. Bottom line is, there is no muscle other than biventer cervicis that does what you say. Your “super-complex” is an imaginary assemblage of cervico-thoracic muscles–such as longus colli dorsalis–and cranio-cervical muscles–such as the various complexus and splenius muscles. If you want to call us out on anatomy, have your facts together. And if you’re wrong–and you most definitely are–please man up and admit it. Waving your arms about some “super-complex” of muscles–like anyone who couldn’t be bothered to look up the names for these things, or their actual origins or insertions–when I’m talking about specific muscle bellies that I have dissected for myself is beyond feeble. It’s farcical. Yes, insignificant. Because you apparently have not read Vidal et al. (1986) and Graf et al. (1995), who explicitly state that the craniocervical and cervicothoracic junctions are not inflection points between individual vertebrae but are spread out over several intervertebral joints. Are you really denying that the duck in the first image has the caudal part of the neck extended and the cranial part flexed. Really? And if you’re not denying it, then there’s no story here. Other than that you couldn’t be arsed to read the relevant supporting papers. I hate to say this, because normally we welcome commentary from any and all, but please either get your facts together or shut up. If you want to keep spewing inaccuracies–and I notice you were strangely silent on the esophagus supposedly being constrained to lie below the vertebrae–please put them on your own blog, and stop pooping in our pool. I wasn’t going to mention it, but it was repeated. I have been trying like heck to see the cranial bit of that duck’s neck as flexed, and have not succeeded. That’s not a habitual position for a (sitting) duck, which would seem to require pronounced flexure. But the references above seem to refer to this specific image and position. Help? Okay, by “cranial” I don’t mean just the part immediately behind the head, I mean roughly the cranial half of the neck. So you can see that cervical 7 is the boundary between the extension posture in the caudal portion of the neck and the flexion posture in the cranial portion of the neck. In the posture captured in the x-ray, the flexion is mostly between cervicals 5-6 and 6-7, with maybe a bit between 4-5. 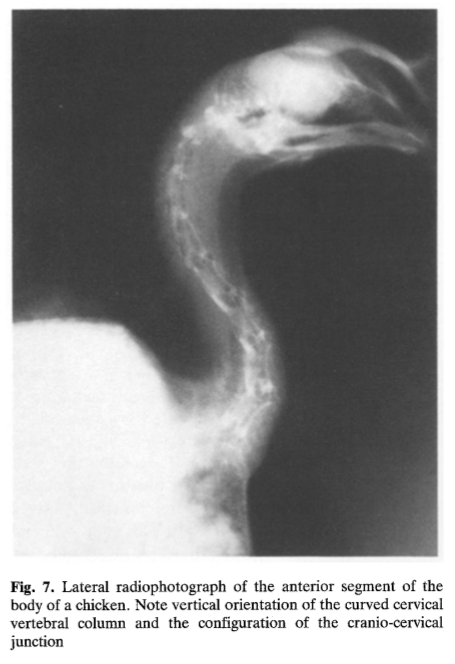 If the duck hadn’t been reaching up, that flexion would have continued all the way up to the axis, as it does in the x-ray of the chicken. Good question, sorry I didn’t explain it better the first time around. This is why it’s better to say “anterior” instead of “cranial”. “Cranial” already has a perfectly good meaning, and the result can only be confusion when it’s used in two different ways. Anterior would have been just as bad, the problem was about extent rather than direction. I am definitely coming around to cranial and caudal as the most universal and least ambiguous directional terms, probably from having to constantly go back and forth between humans and everything else. Or better still, rostral and caudal. “Cranial” is exactly the problem. You talk about cranial flexion, people are going to think you mean flexion of the head. Because cranial means, you know, “of the head”. It may be the most universal of the terms meaning anterior, but it certainly isn’t least ambiguous. Rostral is better, but AFAIK it’s only ever used for parts of the skull, right? Ever heard anyone talking about rostral dorsals? No, “rostral” is only used within the skull. Stumbling across this nice illustration of Anhinga neck musculature reminded me of the discussion here. Seems to show that “functional complex” of epaxial musculature inserting via tendons onto C2,C3 and C4 if I’m reading it right. Not that it really adds anything to the discussion, just a pretty picture. Hot necks like this can lie to me all night long. Hi Neil. Thanks for the badass link. Sorry to be pedantic, but that’s not a “functional complex”, that’s just the longus colli dorsalis. I’ve got photos of it in the rhea and the turkey that I intend to post here soon, I’ve just not got round to it because I’m in England for SVPCA. Agreed about the hotness of that neck. I would totally dissect that. No apologies necessary, Matt. It’s SV-POW. I come for the pedantry and stay for the pneumatics. That turkey neck is making me hungry though. I am happy to say that Mike sauteed almost all of the muscle from that neck and we ate it with lunch.